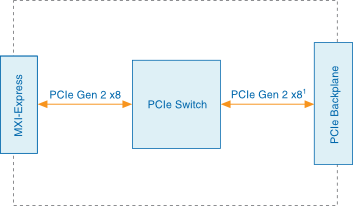 MXI-Express Gen II x8 is based on PCI Express technology. A MXI-Express Gen II x8 kit uses PCI Express switches to enable control of a PXI Express or CompactPCI Express chassis from a PC with an available PCI Express slot, or from a PXI Express chassis with an available PXI Express slot. The switch architecture is transparent to device drivers, so no additional software is needed for CompactPCI Express level support for PXI Express devices in connected chassis. The link between the PC and the chassis is a Gen II x8 cabled PCI Express link. This link is a dual-simplex communication channel comprised of eight low-voltage, differentially driven signal pairs. The link can transmit at a rate of 40 Gbps in each direction simultaneously. This link is compatible with the cabled PCI Express specification developed by the PCI-SIG. The width and speed of the backplane links in the block diagram are chassis dependent. National Instruments offers Gen II PXI Express chassis that allow the PXIe-8384 to establish Gen II backplane links.